Fast Crew Supplier 2610 "AOS SWIFT"
Home › Crew Supply Vessel › Fast Crew Supplier › Fast Crew Supplier 2610 › Fast Crew Supplier 2610 "AOS SWIFT"
Damen Shipyards Group has delivered a Damen Fast Crew Supplier (FCS) 2610 workboat, named AOS SWIFT for the Atlantic Maritime Group on 20 August 2015. 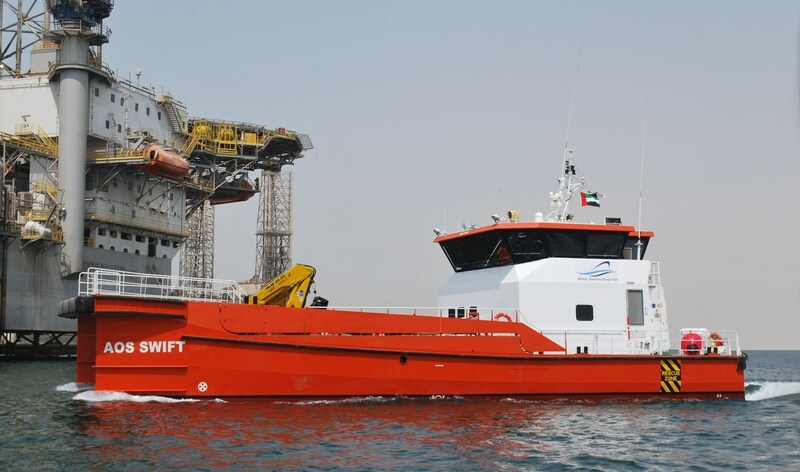 This is the first Damen Twin Axe vessel to be used in the Middle East for safe passenger and crew transfer as well as for the transport of industrial persons, materials and equipment to unmanned offshore platforms in the Strait of Hormuz. Within less than 3 months, and this includes the vessel’s transportation from Damen Shipyards Gorinchem, Damen has customised, commissioned and delivered the stock vessel. Damen signed the contract with Atlantic Maritime Group, in the United Arab Emirates, on 1 June 2015. The vessel is going to be chartered to a Norwegian oil and gas company for its platform operations Offshore Oman.